Acquisitions or mergers are about implementing strategies through the filling of strategic gaps. This may be achieved by implementing a growth strategy, through product and/or geographical diversification, by focusing on core business units or through consolidating manufacturing capacity. Available M&A tools to fill such gaps are e.g., acquisitions or trade sales, joint ventures/strategic alliances and mergers. A transaction does not represent any stand-alone value. It is only a tool for strategic change, not an objective. 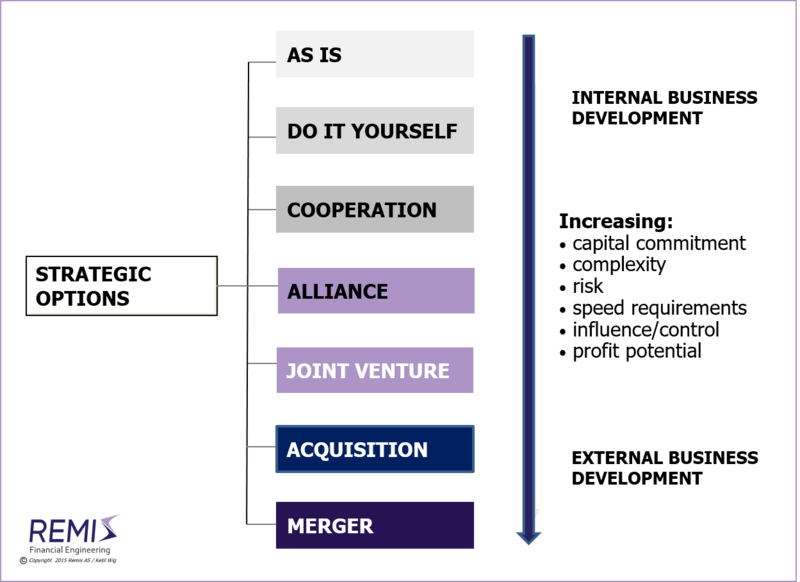 Understanding the links between basic business strategy and the use of M&A is a critical and highly underestiamted domain of knowledge in top management as well as in the M&A industry. For buy-side transactions, managing acquisition risk is critical. Risk comes in three forms: 1) The nature of the acquired entity; 2) The acquisition model – e.g., a merger vs. step-based ownership increase; and 3) The emphasis on post-merger integration. In addition to acquisition risk, the acquisition process itself is risky as you are “one of many buyers.” Therefore, the ability to develop a buyer's advantage is a key factor. Learn more about buy-side M&A. In contrast to acquisitions, divestitures (also known as trade sales) are driven by creating and maintaining negotiation strength through excellent project management and the optimal use of tactics. Unlike an “uncertain" acquisition process, a divestiture process is “certain” in the sense that its outcome is determined only by the seller’s own ability to locate motivated buyers and to negotiate acceptable terms. Therefore, the keys to success in a divestiture are to understand buyer motives and synergies, locate enough buyers and their decision makers, and then negotiate and tactically handle a large enough set of parties to secure the right financial terms. Learn more about sell-side M&A. Also read the separate articles on Strategy and M&A, on Strategic Alliances and Joint Ventures, on Buy-Side M&A, on Sell-Side M&A, on Synergies and Poor Judgment, on Financial vs. Industrial Ownership, on Equity Based Financing of Start-ups, and about M&A Process Management especially related to handling non-financial M&A objectives. See Download Center: White Paper #2: Strategy - and the Proper Use of M&A Tools. A LinkedIn article with a shorter web version of the same white paper is available here; White Paper #5: Buy-Side M&A (mergers and acquisitions); White Paper #6: Sell-Side M&A (divestitures, trade-sales and mergers); or White Paper #7: Should You Choose Financial or Industrial Investors/Owners? ; or White Paper #8: Equity Based Financing of Start-ups and High Growth Situations. Remis AS and Ketil Wig offers financial advisory and consulting services to foreign owners in Norway, handling key priorities related to investments and operational assets. Typical M&A assignments are related to handling acquisitions, mergers, business partner searches (e.g. for strategic alliances or joint venture solutions) or divestitures/trade sales.